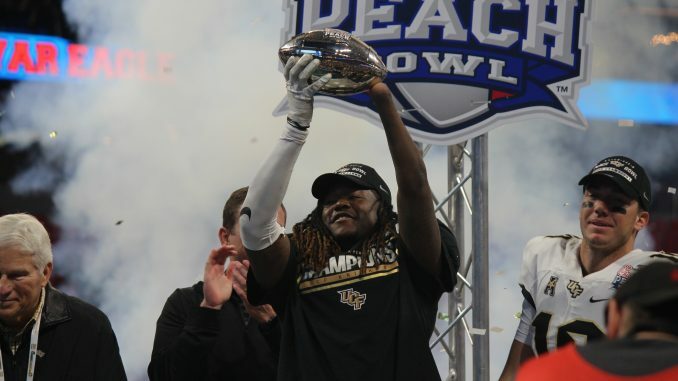 Griffin holds the Peach Bowl Trophy towards the UCF fans. The debate of whether or not UCF Football has the right to claim a national championship has raged on in the months following the season, but there’s one thing pretty much all college football fans outside of Orlando agree on: The Knights’ perfect season was a one-off. There will be no national championship debate next year. No more annoyances from a particularly vocal undefeated team. UCF will fade back to irrelevance just like Western Michigan, Houston and every other Group of Five team before them. Of course, these fans are forgetting recent college football history. Or at least ignoring it. Detractors can talk about the Knights’ weak schedule or their winless season, but there’s simply no denying the fact that they have been one of the most successful programs in the nation over the last few years. In fact, UCF is one of just eight teams with multiple New Year’s Six wins in the last five years. Only eight teams. Out of 130. That’s some pretty impressive company for UCF to be a part of. The Knights are the only non-powerhouse program on that list, not to mention the only Group of Five team. It also says a lot about the AAC’s “Power 6” push that the Pac-12 isn’t represented at all. That group of teams also shows just how much of an imaginary divide has been created by the College Football Playoff Committee and its quest to exclude the Group of Five from the established system. Every single team on that list is unquestionably guaranteed a playoff spot if they have UCF’s record. Two of them even made it during seasons when they failed to win their division. But UCF, after putting together a dominant season, in which the team not only went undefeated but blew out opponent after opponent, couldn’t even crack the top 10 of the CFP rankings. But the committee can only ignore the Knights for so long. As the team prepares for what will almost certainly be another remarkable season, history is starting to add up. And the CFP is running out of excuses.